The large Scopoli’s shearwater, after crossing the whole of the Atlantic, comes to breed each year in the Mediterranean islands. And, towards the end of October, at the Recuperation Centre for Wild Animals, we receive many calls from people telling us that they have found a baby sea gull on land, at the house, or in the street. When we tell them it is a shearwater and not a sea gull, they are stunned. So what is a shearwater? They are pelagic marine birds, meaning that they live in the open sea and only touch land to breed. In the Balearics there are two species, the Balearic shearwater (Puffinus mauretanicus) and the much more abundant, large, Scopoli’s shearwater (Calonectris diomedea). The Scopoli’s shearwater is a species that only breeds in Mediterranean islets and rocks inaccessible to predators. There is another very similar species which nest on Atlantic islands like the Canaries. The shearwater resembles a seagull, but with darker colours diffused over its body, and with an especially designed beak. This beak is a highly technological tool with two nozzles on the top and a sturdy tip, hooked and sharp like a razor allowing them to climb up the rocks, excavating bowls where they nest and from where they dive with incredible agility helped by their wings and capturing elusive prey.The shearwaters are sea animals, and move with great difficulty on land. They live on squid, mackerel, anchovies, sardines and all types of blue fish. They are very gregarious, fishing and moving in large groups. Shearwaters are migratory birds. At the end of February, they enter the Mediterranean along the Straits of Gibraltar and come to the same breeding places each year. They breed in the scooped out bowls, holes and cracks of the rocks along the coast in large colonies. It is typical to see large flocks of the shearwaters returning from the sea to get to their nests, but not before the darkness of the night. They do not do it in daytime. In the middle of May the female lays one egg in the nest, and the male and female incubate it in turns. The chicks hatch in the middle of July. The parents are out at sea fishing by day and return at night to their nest to feed their chick. As the chick grows into the space, the visits to the nest decrease, the parents making ever longer flights spending more hours looking for food, as far away as the Gulf of Leon and the Catalan coast. At night, the cries of the chicks are like the demanding cries of children, asking for their sustenance. Then comes the day when none of the parents returns to their nest. They have decided to leave for the wintering areas abandoning their children that have grown sufficiently. This happens in the second half of October. The little birds are obliged to leave their nests and look for food themselves. At night fall they fly towards the sea. They recognise the sea by the moonlight reflecting on the surface. At night the sea shines and the land is quite dark, unless it is an urbanized area where the artificial light then confuses the young birds. This is the reason for finding birds that are distressed in our streets at the end of October. 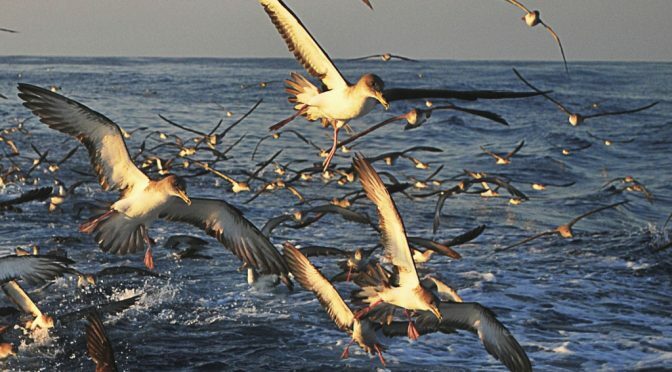 The shearwaters leave the Mediterranean for the winter areas of the Atlantic. Those born in the Balearics winter along the Western Sahara coast, the Gulf of Guinea, Namibia and Angola. The young do not return to our waters for four more years, as they do not breed until they are 6 to 9 years old. It takes about a fortnight to travel the thousands of kilometres of their journey making use of the Atlantic winds. This makes the outward time much shorter than the return when the winds oblige them to make a long flight across the whole of the ocean, skimming the coasts of Brazil and the British Isles. The birds have evolved over thousands of years with almost no predators. The places where they breed were very safe. This is the reason for making only one egg. Nowadays there are more worrying problems for their future which are because of certain fishing methods especially those using fishing lines with multiple hooks and net. Other problems are sea contamination, the destruction of breeding grounds as well as predators, especially rats and wild cats that have been introduced into the colonies. It is estimated that the Spanish population of shearwaters is 10,000 pairs of which 80% to 90% breed in the Balearics. The most numerous are found in the colonies of Menorca. It is catalogued as a “vulnerable” species strictly protected at European, state and local levels. Distribution: breeds in all the Balearic islands and other Mediterranean places. Winters in the Atlantic. Reproduction: Oviparous. Lays one egg in May. Incubation 53 days.